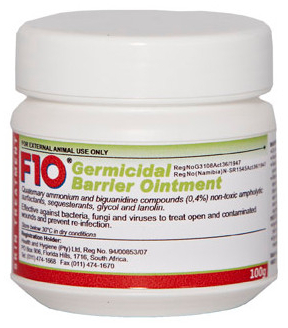 F10 Products Germicidal Barrier Ointment is a long lasting antiseptic barrier used to treat and protect open and infected wounds against fungi, bacteria and viruses. Benzalkonium Chloride 0.40g/100ml, Polyhexanide 0.03g/100ml. 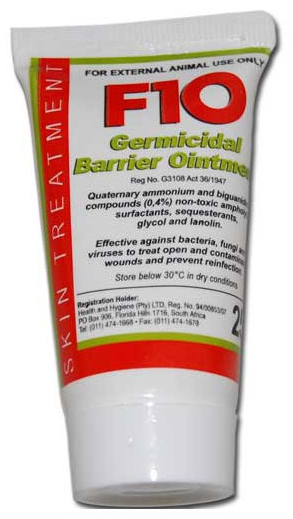 Below are some recent questions we've received regarding F10 Products Germicidal Barrier Ointment, including answers from our team. Is there an issue if a dog licks this .I do plan to cover the area but it would be good to know as my dog is quite "resourceful" when nibbling at a sore! It won't do your dog any harm if he does lick it as it is only an antiseptic, although i am not sure he will like the taste of it.